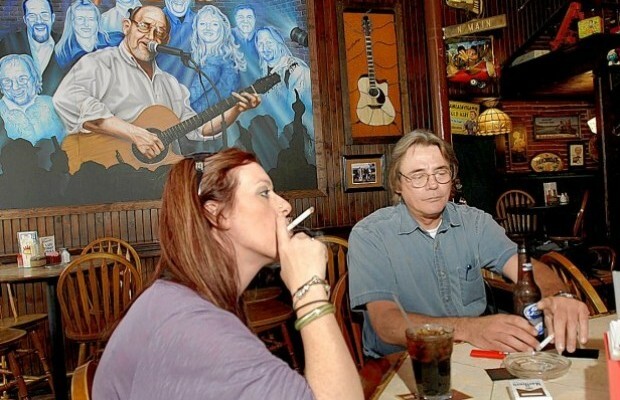 John Stillman and Kandi Wetzel smoking at Rumples Pub in St. Charles in a 2011 photo by Roy Sykes, Journal. ST. CHARLES COUNTY • The County Council won’t go to court to fight Elections Director Rich Chrismer’s removal of a smoking ban package from the Nov. 6 election ballot. The council in an unusual Saturday meeting also decided against putting before voters an alternative ban with exemptions for the Ameristar Casino, bars and other facilities. The upshot: No smoking restrictions are likely to be on the countywide ballot this year. After emerging from 90 minutes of closed sessions, Council Chairwoman Nancy Matheny said the council wouldn’t sue Chrismer because members didn’t want the county taxpayers to pay the legal costs of both sides amid tight finances. “The consensus now is we will not proceed with having anything on the ballot,” said Matheny, R-Weldon Spring. Then the council voted 6-0 to remove from its agenda the alternative bill lumping a ban with widespread exemptions. Councilman Joe Cronin, R-St. Paul, said there remains a way to get the council’s original package on the ballot — getting an anti-smoking group to sue Chrismer. “Hopefully a public health organization will come in and enter the fray,” Cronin said. Matheny and Cronin said the council’s two-proposition package blocked by Chrismer was the best choice. Under that plan, residents would first vote on a countywide ban with no exceptions. A second proposition would exempt any facility where all patrons and employees are over 21; that would cover bars and casino gambling floors. That exemption measure also would apply to private clubs and up to 20 percent of hotel rooms. Chrismer, who wasn’t at the meeting, shot back in a telephone interview. He pointed out that he removed the two proposed county charter amendments because of inconsistent and confusing wording. “Maybe if they hadn’t been so sloppy and so quick to try to change the charter … they wouldn’t be in this situation,” he said. A clean-up bill to correct the wording errors was introduced Monday but some council members say they expect Chrismer to also cite other objections. Sitting a few feet away was Ameristar general manager Jim Franke, who filed suit Tuesday to try to keep the two-question proposition off the ballot. “I just don’t think the attacks are appropriate,” Franke said later, adding that the firm went to court “to protect our business” and many employees’ jobs. Ameristar and other critics of the two-proposition approach worried that voters might approve the ban but defeat the exemption. Ameristar fears it will lose customers if it goes smoke-free while competing casinos in St. Louis County and St. Louis remain exempt from smoking bans. She said it was too soon to comment in detail on Cronin’s appeal for a private lawsuit. “That’s not really our typical mode of action,” she said. Matheny said the smoking ban alternatives could be discussed in closed session because they were related to possible legal action by the council. Meanwhile, the council voted in open session to put two other propositions on the ballot if a judge agrees. They would change the way council vacancies are filled and modify rules barring county officials from accepting items of value from companies and people having dealings with the county. The council previously had lumped the two in one proposition. Chrismer removed it, arguing that mixing two issues ran counter to state law. Theoretically it’s much safer, regardless of your profession, not to work, than to work. And, adding on to Dave’s comment: Why should anyone “have to be exposed to unnecessary carcinogenic solar radiation to hold a job?” The answer, to be consistent, is that no one should be. Such exposure is neither inherent nor necessary to drinking or dining: If you’re going to justify smoking bans on such a basis then, for consistency, you’d have to support banning daytime patio dining. There’s no reason in the world why restaurants can’t serve their customers safely indoors without exposing workers to the hazards of outdoor exposure. Remember: awnings and sunscreen, just like ventilation, only provide *partial* protection. The simplest counter to my argument is simply a clear statement that you would be supportive of such a ban out of your concern for those workers. Simply saying “It’s not our issue.” isn’t a strong enough comeback: no one’s asking you to drop your work and campaign for patio-dining bans. I’m simply asking if you would support such an idea in principle. Former tobacco control smoking cessation specialist degreed in 6 weeks. I am currently seeking employment in my profession or as closely related as can be made. I have recieved notice from my current employer that my services are no longer required due to Government economic cuts. It is my understanding that your deptartment is in need of professional marketing strategies in pro-tobacco campaigns. As a former task manager of any plan that came to mind,my services should help in growing your companies business and customer base. Psst Ive also got a buddy Gene Borio and he is also starving. mogasp note: Actual name of writer substituted as required to be considered for approval. John, I may not support Martin’s views, but I’m pretty sure he’s not getting any “government money” for his work. Gene might be different story though: I think his interview several years ago with Philip Boucher indicated that he’d gotten funding from either TTAC or RWJF or some branch or other of the NicoGummyPatchyPushers, though Martin may know more about the details/truth of that than I do. mogasp reply: MoGASP started in 1984 as St. Louis GASP, later changing its name to Missouri GASP as it sought greater reach. The first meeting was in my home, attended by Paul Smith who was seeking financial help with a lawsuit for his efforts to obtain – not a smoke-free workplace – but just some protection from it in his immediate vicinity when he worked at Westinghouse Electric. MoGASP’s primary income has been membership dues, apart from a one-time grant from a local private foundation to do a series of nicotine measurements. MoGASP stopped collecting dues a few years ago because it proved too time consuming, and our overhead is very low. MoGASP operates out of my home office and whenever I’ve attended council meetings and the like I note my car mileage for my tax return but don’t claim anything from MoGASP. The same has been true for billed long distance phone calls in the past except I didn’t record the time or claim them on my taxes: it was too much trouble. After nearly 30 years I’m winding down my MoGASP activities. I think that’s long enough to try and obtain smoke-free air, and fortunately significant progress has been made. 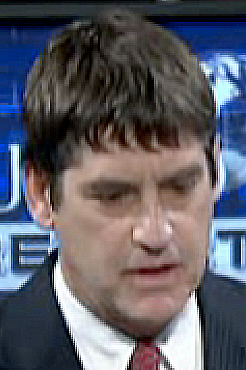 Thanks for sharing the background MoGasp. That was pretty much what I thought the situation was from things you’ve said over the years.